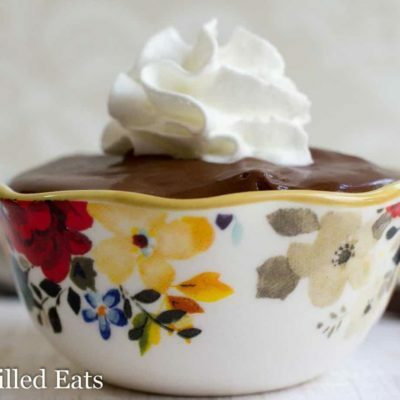 This Rich Chocolate Pudding Recipe will satisfy any chocolate lovers craving. It is so smooth and creamy no one will ever guess it is dairy and sugar-free. I set out to make dairy free fudge yesterday. And I ended up with pudding. That is a kitchen fail I can live with. The only low carb puddings I’ve tried have had a thickener in them that ends up altering the texture. 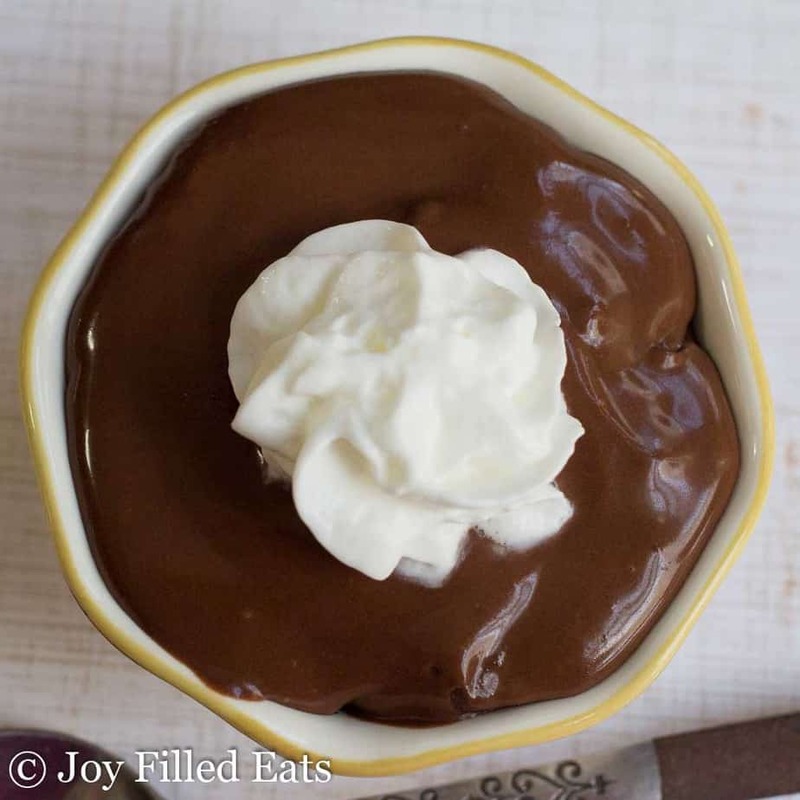 This pudding is basically reduced coconut milk with sweetener and chocolate. No thickeners are needed. It takes a good amount of time to reduce the coconut milk but you only need to give it a stir every 10-15 minutes so it’s pretty hands off. 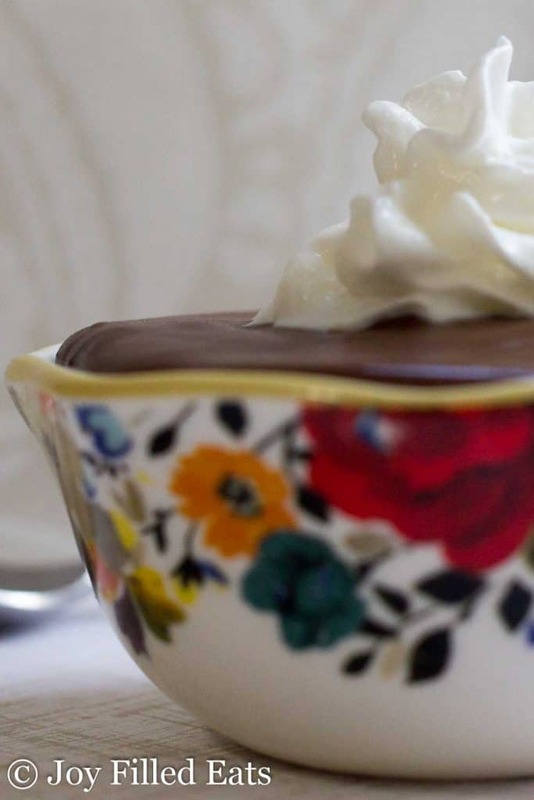 Every bowl of chocolate pudding deserves a dollop of whipped cream. I cheated and used a squirt from a can (not dairy free and it has a small amount of added sugar) for my photos. Anytime my kids see a can of whipped cream they want a squirt in their mouths. I am happy to oblige. I believe whipped cream directly from the can into the mouth is a necessary part of childhood. *** You can use unsweetened chocolate but may want to increase the sweetener to taste. You can also use stevia sweetened chocolate, like Lily’s, but then decrease the sweetener to taste. 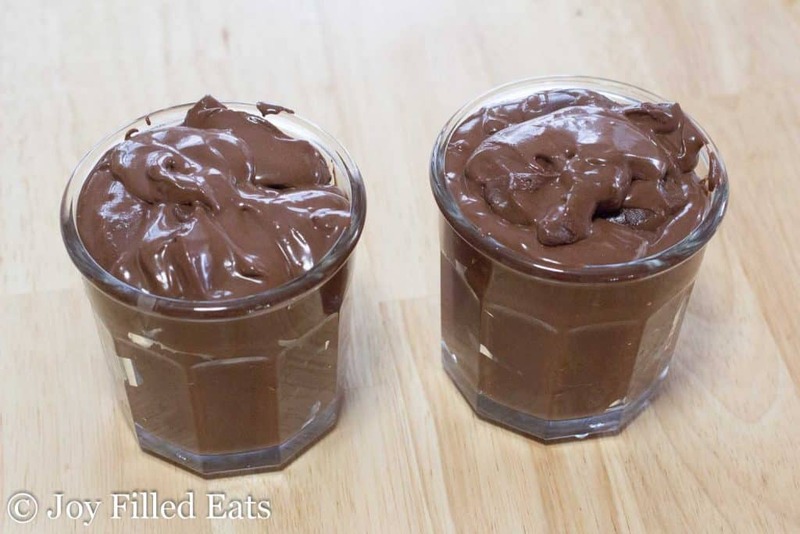 How to make chocolate pudding recipe: Reduce the coconut milk, sweetener, and oil in a saucepan. Pour over the chocolate. Mix thoroughly. Add vanilla and salt Chill. This makes about 30 oz of pudding. It is so rich I recommend 3 oz servings. With whipped cream on top, of course. 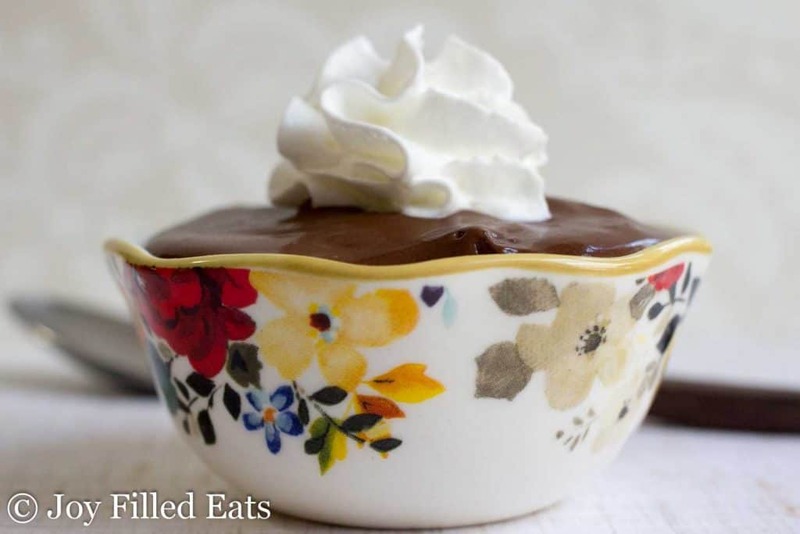 This Rich Chocolate Pudding will satisfy any chocolate lovers craving. It is so smooth and creamy no one will ever guess it is dairy and sugar-free. 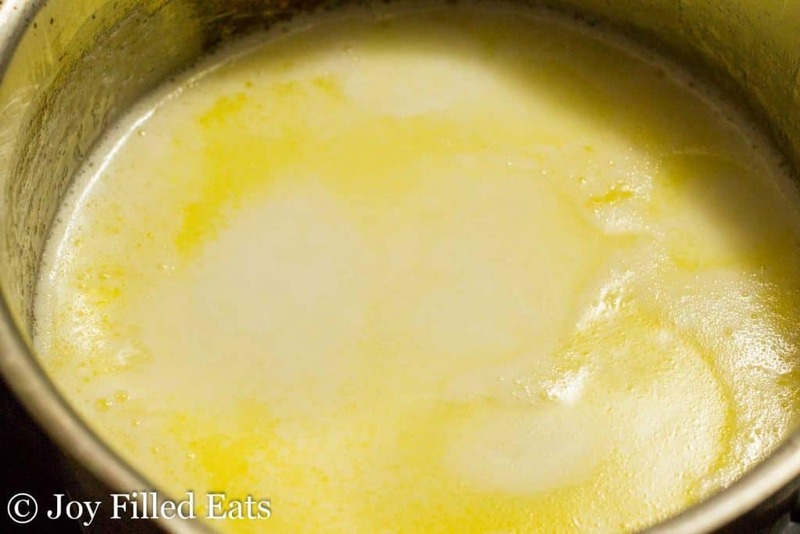 Combine the coconut milk, sweetener, and coconut oil in a medium saucepan. Cook on medium until simmering. Reduce to medium-low or low and simmer for about 1 hour until reduced by half. Stir every 10-15 minutes. Put the chocolate in a large glass bowl. 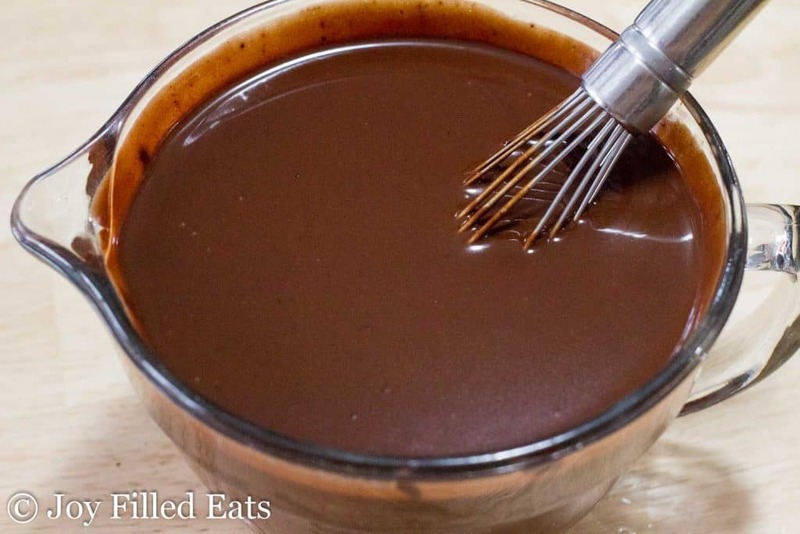 Pour the hot reduced coconut milk over the chocolate and whisk until melted and smooth. Stir in the vanilla and salt. Transfer to a glass dish and refrigerate until thickened, at least 4 hours. *** You can use unsweetened chocolate but may want to increase the sweetener to taste. You can also use stevia sweetened chocolate, like Lily's, but then decrease the sweetener to taste. This is so easy and incredibly delicious! I used 85% chocolate because it’s what I had on hand, and I halved the recipe for my family of 4. I wasn’t sure if my kids would appreciate the rich, deep dark chocolate taste. But they gobbled it up! Hubby went back for seconds, which says a lot. This is a recipe I will even use for when we have dinner guests over — served in pretty glass dessert cups or martini glasses. For my kids I did put a squirt of whip cream and a few sprinkles on top. Highly recommend this dessert even if you don’t need to be dairy free. Does this make vanilla pudding if you leave the chocolate out or is the chocolate one of the thickening agents in this? I think the chocolate is a thickening agent. I'm not quite sure what would happen if you totally left it out. I think you could sub in raw cocoa butter for a white chocolate pudding. What kind of chocolate bars do you use to make this dairy free ? I used Lindt 90% dark chocolate bars. Most 85% dark chocolate does not have dairy. I made this, and it was awesome! 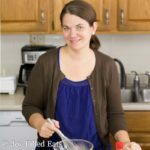 My picky kids didn't even know it was healthy or sugar-free. Mine, too, turned to fudge when I refrigerated it. It was like a lovely chocolate ganache. I should have gotten out the scooper, and rolled the balls in lightly sweetened cocoa powder... Viola! TRUFFLES! Loved this super versatile recipe! About ten. This makes about 30 oz of pudding. It is so rich I recommend 3 oz servings. Yay for fudge! That is so funny. I need to try again :) I thought I should've just reduced longer or just used a little less coconut milk. If I don't have buttered flavored coconut oil can I just use Kerrygold butter mixed with coconut oil? If you don't need this to be dairy free you can just use the kerrygold butter. Or refined coconut oil so it doesn't have a coconut flavor.